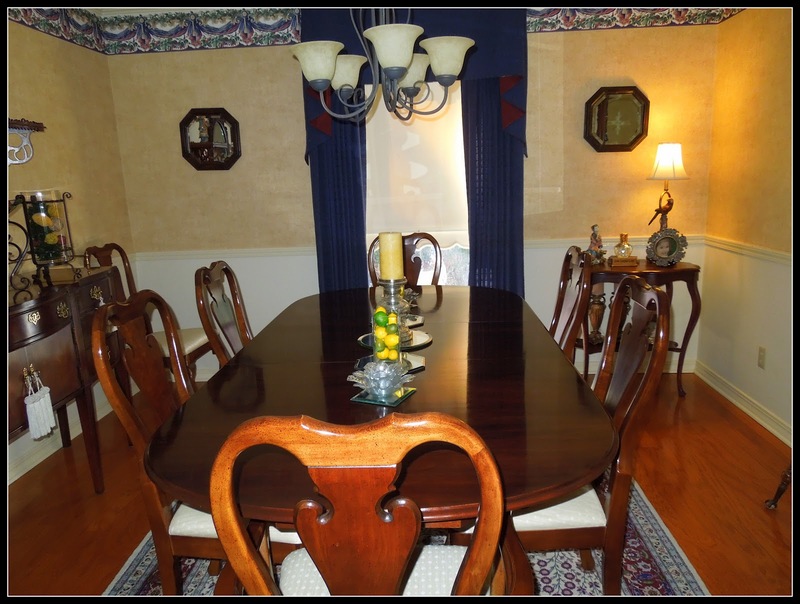 We have lived in our house 31 years this July and over the course of those years, this dining room has hosted more events than I can even remember. The majority of them have been bridal affairs. You know, as I've said many times before, here in the South we make an "event" out of any and everything we can. Now, most of the use for this dining room is family dinners and occasional entertaining of a few couples. The days of "events" are rare. But, I have fond, fond memories of the fun times that have been had in this dining room. 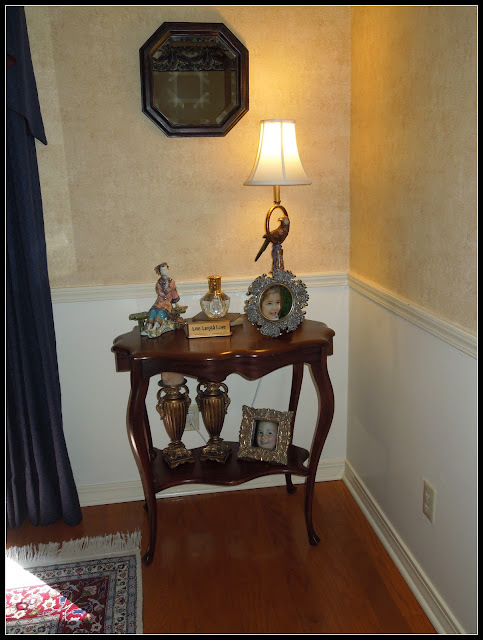 This antique table graces one of the corners of the room. I found this at a shop a few years back and I just knew that I had the perfect spot for it and I did. All of my furnishing in this room are either walnut or mahogany. This sideboard sits on one wall and is just a beautiful piece of furniture. Our dining furniture was the first furniture we bought when we moved in this house, so guess that means it is 31 years old. Yikes! but as you can see, it has been given a lot of TLC and still looks brand new. This piece is great for storage as well. I decorate the table for the season. 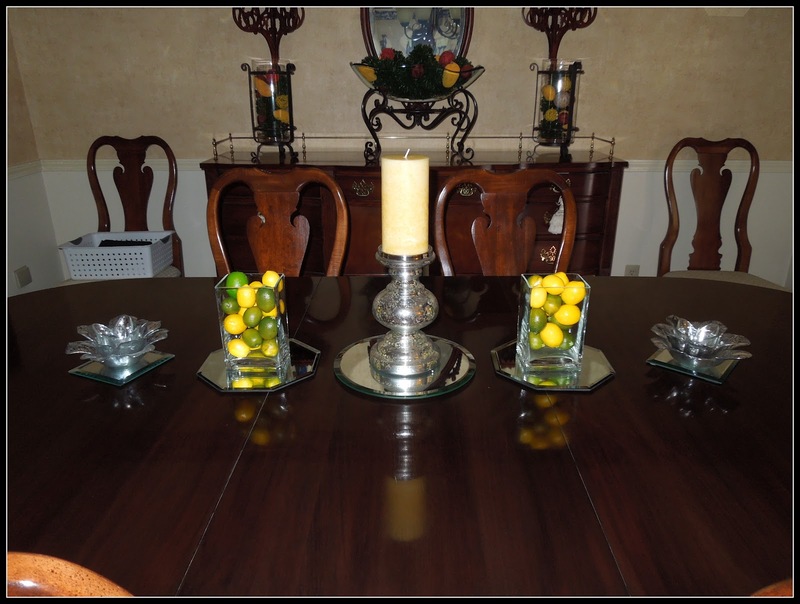 For this summer I chose to use mirrors, mercury glass and clear containers with lemons and limes in them. 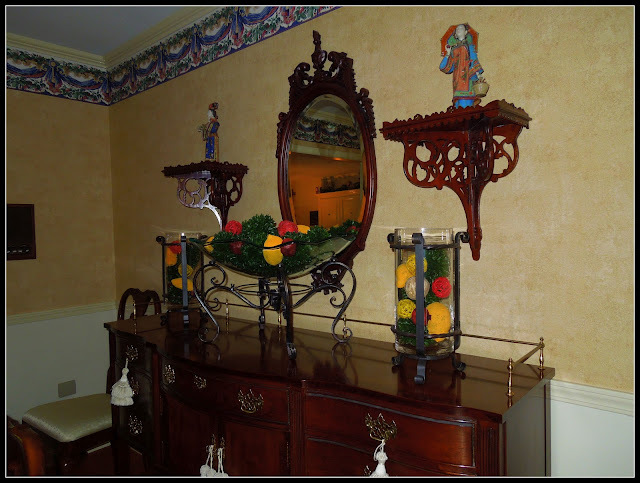 The decor on the sideboard pretty much stays the same year around (except at Christmas). There is one problem with our dining room and that is it's size. It is not nearly big enough and it needs to be open on two sides, but there is only one entrance. That means there is only one exit. Not good! It's especially problematic when you have about 40 people trying to get in and out of the room to enjoy the delicious goodies that are on the table. But, somehow it has worked, but be rest assured if I ever have another dining room, it will have a nice flow pattern for sure. Thanks for dropping by. 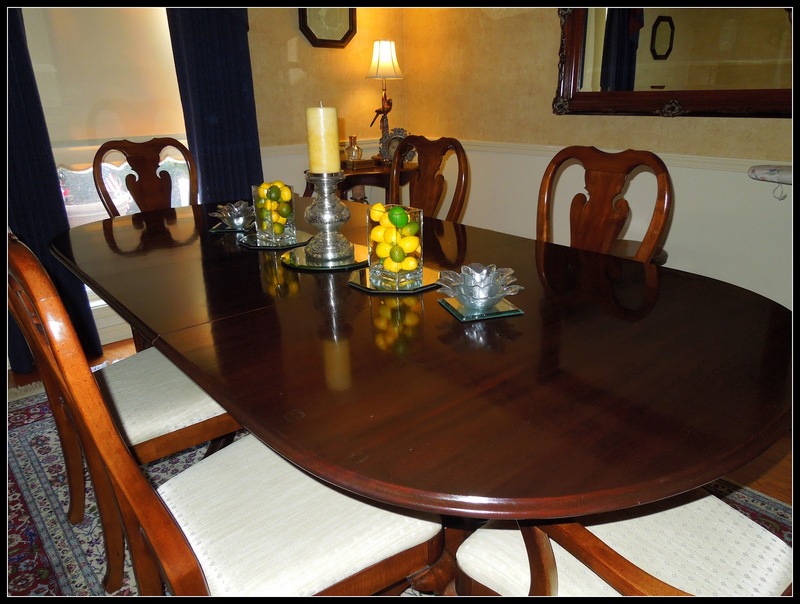 I hope you enjoyed your visit and I look forward to taking some tours of your dining rooms as well if time permits. And, just in case you have forgotten...........I'm in Dodge City enjoying time with our daughter and her family. Happy weekend to you! i love the lemon and lime centerpieces. gorgeous! i enjoy glimpses like this into your beautiful life. it all looks lovely! Hope you're enjoying your time in Dodge City! You did a fantastic decorating job! Beautiful. I didn't grow up with a dining room and that is the first thing I wanted in my house. Now we have a table that seats 12, and since our family is still growing we will need more chairs. Your dining room is beautiful! You have a lovely home. I especially love the lemon and lime centerpiece. How unique and cheery! I'm sure you are a wonderful hostess no matter how your dining room looks. But it is lovely. I really like your lemon/lime centrepieces. They are so fresh and summery.